The Vernier Rotary Motion Sensor is a bidirectional angle sensor designed to measure rotational or linear position, velocity and acceleration. It is used for a variety of investigations, including measurement of rotational inertia and verification of the conservation of angular momentum. The following examples show various ways to use the Rotary Motion Sensor. Some of these examples use accessory products described below. Attach the 3-step pulley to the rotating shaft. Use the thumb screw to attach the Rotary Motion Sensor to a ring stand. Attach each end of the string to a mass and run the string over the pulley. Use the Rotary Motion Sensor to determine the acceleration of the system. Attach an Ultra Pulley to the Rotary Motion Sensor. Attach the 3-step pulley to the rotating shaft. Attach the disk to the 3-step pulley. Attach a string to the underside of the hub. Attach the Ultra Pulley to the Rotary Motion Sensor using the Ultra Pulley Swivel Mount. Run the string over the Ultra Pulley and attach a weight to the end of the string. Use the weight to apply a torque to the system while the Rotary Motion Sensor measures the angular acceleration. Use the same set up as described in the previous section. This time attach a rod with two masses to the 3-step pulley. Use the weight to apply a torque to the system while the Rotary Motion Sensor measures the angular acceleration. Attach the disk to the 3-step pulley. Give the disk a spin. While the system is rotating, drop a second disk onto the first disk. Observe the change in the angular velocity before and after the mass is added to the system. Attach the 3-step pulley to the Rotary Motion Sensor with the small step next to the sensor body. Attach the center of the rod with two masses to the pulley. Position the masses so they are not symmetric. Position the sensor so the face of the pulley is vertical. Start the pendulum swinging, and determine the angular acceleration as a function of the angle. 3-step pulley on the Rotary Motion Sensor shaft is hold the shaft to prevent rotation as you turn the pulley to align the key to the slot. The o-ring can be slipped over the outer pulley to increase friction when the pulley is in contact with a surface. The thumb screw can be threaded into the back of the sensor allowing the Rotary Motion Sensor to be attached to a ring stand. The sensor also has a set of accessory mounting holes which allow it to connect to existing accessories. Note: High resolution mode is also known as X4 mode. When active, the sensor has a 0.25 degree resolution and a limited maximum measurable rotational velocity. The Rotary Motion Sensor uses a quadrature optical (incremental type) encoder to measure the amount and direction of rotation. The encoder, which is attached to the rotating sensor shaft, consists of a coded pattern of opaque and transparent sectors. The quadrature encoder produces two pulse output patterns 90° apart in phase. The position of the shaft is determined by counting the pulses. The phase relationship between the output signals determines the direction of rotation. 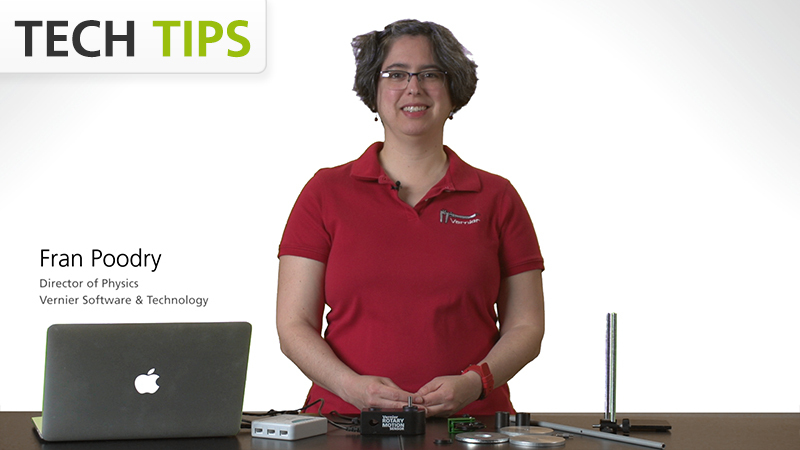 If you have watched the related product video(s), followed the troubleshooting steps, and are still having trouble with your Rotary Motion Sensor, contact Vernier Technical Support at support@vernier.com or call 888-837-6437. Support specialists will work with you to determine if the unit needs to be sent in for repair. At that time, a Return Merchandise Authorization (RMA) number will be issued and instructions will be communicated on how to return the unit for repair.